Excite your fanbase with an amazing prize while creating awareness about your favorite cause. A sweepstakes campaign is a story. It’s the best way for the world to learn about your philanthropic work. Why would fans make a $10 donation for a “Thank You” email, when they could make a $10 donation and meet their idol? Our most successful campaigns have raised over $1M in just three weeks! Your campaign will be created and supported by Prizeo’s team of strategists. Building a landing page, merchandising rewards, designing swag, marketing the campaign...we will take care of it all. Excite your fan base with an amazing prize while creating awareness about your favorite cause. A sweepstakes campaign is a story. It’s the best way for the world to know about your philanthropic work. Your campaign will be created and supported by Prizeo’s team of strategists. Building a landing page, merchandising rewards, designing swag, marketing the campaign…we will take care of it all. Prizeo is one of three consumer platforms under Charity Network's umbrella. By working in tandem with our sister companies—auction platform Charitybuzz and content studio Chideo—and our syndication partners in TV and online, we can push out campaigns well beyond the celebrity’s own community. We manage all the nuts and bolts, from start to finish and beyond, leaving you free to tell your story. We prepare an integrated marketing campaign that focuses on driving awareness and engagement. We build pitches for targeted media outlets, create talking points, and work with our media partners to spread the world. We create custom creative assets for you and your partners to use to across social media channels to drive increased fan engagement. We leverage paid media to increase awareness and maximize fundraising potential. No upfront costs or added fees, just positive returns. Our team will build out rewards your fans will love, encouraging them to donate at highger levels to your charity, and getting more chances to win the grand prize. Every $10 donated is 100 entries to win! Prizeo creates the designs and uses your feedback to make it personal to who you are. Production and fullfillment? We'll handle that too. 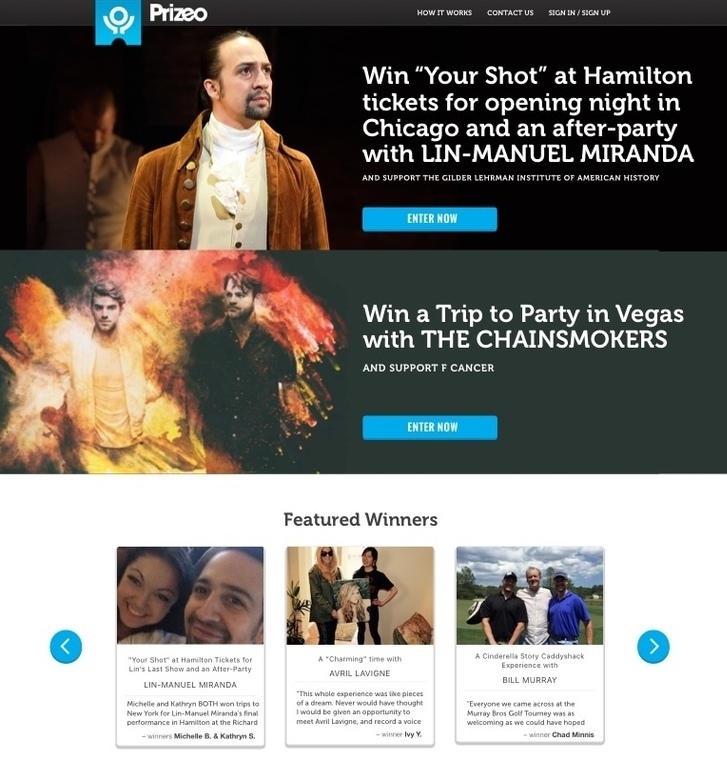 And if you want to donate more meet-and-greets as rewards, we can activate our sister company, Charitybuzz to reach donors who are ready to $5,000 or more to create an extra impact for your charity's work. Activating your campaign is as simple as giving us the greenlight. Next you will make your launch video, and then start promoting across social media. With suggested social posts and artwork to help guide promotion, we are here to help every step of the way. Copyright ©Prizeo. All rights reserved. Once-in-a lifetime experiences and sweepstakes for cause. Through a network of syndicated partners including Sinclair Broadcast Group, Tribune Media, The Ellen DeGeneres Show, Twitter, Delta Airlines, and more. Charity Network can amplify a cause message to reach more than 80 percent of U.S. TV households.